John Royce, the owner of the Fox Hill Inn, is the reason hundreds of community members, including local government officials, have gathered at Brookfield’s premiere mansion-style banquet and catering venue for eleven consecutive years. Without Royce’s vision and generosity, today’s Hearts of Hope breakfast benefitting the Women’s Center, would not have happened. “He is the founder of this very breakfast. Eleven years ago, he came to us making an offer we absolutely couldn’t refuse...If we created the program, he would provide the venue, the staff and the food, all at no cost,” said Felicia Paduano, Women’s Center Direct Service Volunteer, and 2019 Hearts of Hope Breakfast Chair. Even the Fox Hill Inn waitstaff works without pay, year after year, allowing all funds raised to directly benefit the Women’s Center, a safe haven for victims of domestic and sexual violence in Fairfield & Litchfield Counties. Royce, who has served as a member of the Advisory Council and helped to launch the Men Against Domestic and Sexual Violence Group, was honored today as the 2019 recipient of the Women’s Center’s “Service Above Self” award. 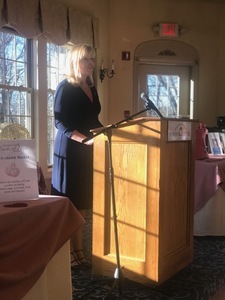 The morning’s speaker, introduced by Women’s Center President and CEO Pat Zachman, was Ridgefield resident Lisa Whelan. “Hope is a bird that flies higher than others,” said Whelan, who told her personal story of domestic violence, using a metaphor about a bird without wings to describe her journey from a place of fear and despair, to a place of hope. “Only hope can light the way”, she said. Whalen, who has been an educator in the Ridgefield Public School system since 1986, is the mom of two grown children. She spoke of her love of family, running, and commitment to the mission of the Women’s Center. “One thing you don’t know from looking at me is that I’m a survivor of domestic violence. I don’t fit your typical vision of domestic violence,” she said. Then, Whalen told her harrowing story of violence, at hands of her then-husband of twenty-five plus years. “Four years ago, on a warm August night, I was beaten and almost killed by my ex-husband. The man I had been married to for over twenty five years,” Whalen said. The horrific events unfolded after Whalen listened to a voice message on her husband’s phone, heard her friend utter the words, “I love you”, and confronted her husband in their bedroom on the second floor of their home. “A look of rage crossed his face that made me turn and run,” Whalen explained. Her enraged husband ran after her, down the stairs. He grabbed her and began to beat her. “He smashed my ears so I lost my hearing, he smashed my head into the frame of the couch - I layed on the floor motionless,” she recalls. Finally, when Whalen could muster up the strength to pick herself up, she ran outside and hid in the bushes. She heard her husband start their Jeep and leave the driveway and knew this was her chance to survive. Whalen ran back into her home and made a phone call. “I called my family, my hope,” she said. As she was on the phone, she spotted the headlights coming up the driveway, and shining into their home. She was able to escape her home without her husband seeing and continued to hide in a neighbor's yard until she heard a car on the road. “It was like a scene from a 007 Movie,” she says as she describes seeing her getaway car and her niece opening up the door. She was safe. After heading to the police station to document the events, Whalen was taken to the hospital via ambulance to be treated for her injuries. Thanks to the support of her family and friends, and the programs, services, and resources provided by the Women’s Center, Lisa Whalen was able to find hope. As a leader of the Speaker Bureau for Safe Horizon, one of the nation’s leading victim assistance organizations, Whalen is now helping others find their “hope”. She believes that “Post Traumatic Growth” is achievable for everyone. 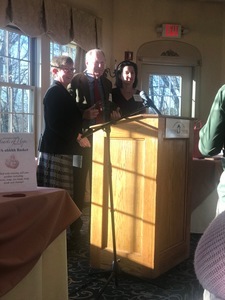 Thank you to Felicia Paduano, the Breakfast Chair, the Fox Hill Inn for donating your beautiful venue, and to all of Inn’s wait staff who served with a smile and donated all of their time. Much gratitude to Benefactors Praxair as well as Breakfast Advocates, Lori Berisford, Elaine Cox, and William and Wendy Beurket. Thanks to Hearts of Hope Breakfast “Friends” including Felicia Paduano, Union Savings Bank, and Glori & Adam Norwitt. Save the date for the Women’s Center Gala, “An Evening Together” on April 5. Learn more here. Founded in 1975, this year marks 42 years that the Women’s Center has been a safe haven for victims of domestic and sexual violence in Fairfield & Litchfield Counties. To learn more about the Women’s Center or to have the Center visit your school, click here. To become a volunteer, click here.